Actually, on second thought, don't call me puff daddy. 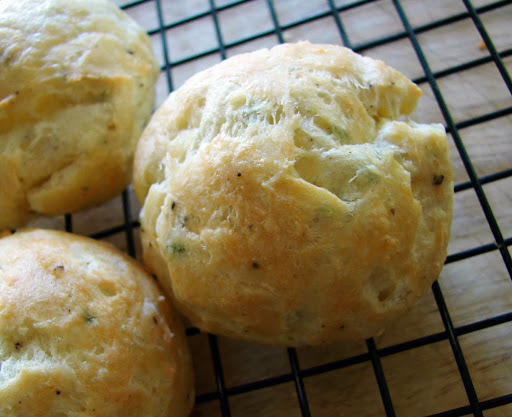 These beautiful cheese puffs, called gougères in French cooking, are as easy as they are delicious. The buttery, eggy dough (called Pâte à Choux) is the same one we used for the blue cheese fritters, so if the first minute of the video looks like a repeat, it's not! There's a French bakery called Tartine in my neighborhood that makes these amazing extra-large gougères studded with black pepper and fresh thyme leaves. It's like my favorite thing ever, and I can't believe it took me this long to make them myself. Usually, gruyere cheese is used, but I had some very sharp farmhouse cheddar in the fridge, so I decided to use that. As long as you are using a very sharp, full-flavored cheese I don't think you can go wrong. I love gougères with gruyere, but I think the extra-sharp cheddar was just as good, and maybe better, at least to my palette. Since gougères really don’t take much time to prep, and only 15 minutes or so to bake, they are great appetizers for a party. They're okay after they sit for a while, but if you really want to treat your guests, make them in small batches a few times during the party so people can taste them warm. One of the greatest smells in the world comes from that glorious, cheesy wisp of steam that escapes a freshly baked gougère as it's torn open. Which reminds me, make twice as much as you think you'll need – these are very addictive and will turn normally well-mannered guests into out-of-control gluttons! Enjoy. Wait did you say buft instead of buff? Sooooo dangerous! Why do you do this to me? It's just too tempting - screw the diet! Nice blog! You got my Foodbuzz vote! Nice video! Well thats easy, I was to busy drooling over the cheesy pastry to worry about grammar! Nice chef John! Recipe sounds like my popover recipe, so with that in mind can you use milk instead of water and not 'simmer' it? The shots are even pornier with the pate a choux this time around. Evil you are! Tell me: would the recipe for pate a choux still work if margarine was to be used instead of butter? I am so afraid to make all things that puff in the oven. i can imagine the look on someones face to find it hollow inside then they break it open/bite into it. PLEASE, I ASK YOU PLEASE DO NOT AGAIN THE ITALIAN RECIPES. It's terrific the way you made the italian food. yeah, yeah. I get it. I'll eye-ball each ingredient extra hard this time. Hi Chef John! I'm no expert on French pronunciation, but I did have to take French lessons for 4 years of my existence and grew up in Canada. 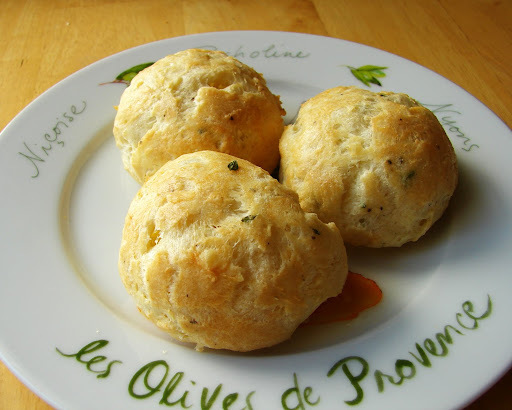 The way you're saying, "gougère" sounds right to me (kinda like goo-djare). Another fantastic video. I'm hoping to be able to make these, lactose intolerance be damned. and just call them googers. My cheese-craving-mom-to-be wife is going to love these... How long do they keep? I'm throwing a Halloween party and a big basket of these would be a hit fo sho. they should be made fresh. I don't like them after they sit for a long time. I reckon I should be able to get Gruyere in the big shops. I'm going to make these next time I make a cheese bisque, but who will revive me from my cheese over dose. Can we call you G Diddy? I am curious about the volume of cheese...if I wanted to use something like blue cheese which doesn't grate up nice and fluffy could you suggest a weight? I am presuming that the consistency (and the success) of the dough would be affected by too great a proportion of cheese? Gosh, I'm silly, you can just ignore my previous question, since I looked at the blue cheese fritters recipe, I answered my own question. For this recipe, I'd use 4 oz blue cheese. Great recipe, great video, as always. And, with eight years of French under my -- um, cranium -- I'll state unequivocally that it's pronounced: goo-ZHAIR. Yes, one of your three pronunciations is correct! Also - YAY!!!! I'll make these as appetizers when friends come over for Confit Biyaldi and a viewing of "Ratatouille"! But - a question: You don't pierce the gougeres when they come from the oven. I was told that was essential. Non? Basia, i've never heard of the poking - maybe to let out the steam to keep crisper? It's such a moist dough I cant imagine it staying crisp too long. I will have to try! After mixing the eggs, the dough became very watery, not as stiff as it is in the video. Any tips? I was wondering if this could be frozen before baking. I want to do some for a party and I dont want to be just before they arrive. I remember in pastry lessons, I always always managed to ruin my choux pastry by adding an egg too much. I would follow the recipe but maybe the eggs were too big. But we were also working in very big quantities I reckon I shouldn't mess it for these proportions. yes the eggs were probably too large. I know some people claim you can freeze and reheat, but i've never tried. You can make the dough ahead and just bake batches to order. Help Chef! I made these today and measured exactly and followed the recipe, but they turned out flat - no hollow puff inside. Not sure what I did wrong, other than my choux dough at the end looked more wet than yours did. Anyways, the flavor was amazing, I still enjoyed eating them. These are one of my favorite things to make for a lite appetizer before dinner w/a nice glass of vino. I also make a breakfast version, sprinkled with sugar pearls or coco nibs, they make them in one of my favorite bakeries in Paris and we live on them for breakie when there! Ok, so now I hve to make a choco nib version. Sounds great! I attempted to make some nice and light cheese puffs this weekend and all I got was a buncha tough cheese cookies. Little help here? Usually means eggs not whipped in thoroughly enough, or too much cheese. Hard to say since I've luckily never had cheese cookies happen to me. Watch and try again! Chef John... your videos are sooo much better than that hack from about.com. Viva les souhaits de nourriture!! Tried again with an electric mixer, being careful when to add the 2nd egg (after about a minute of mixing). And they puffed... kinda. Would it matter that I used whole wheat flour instead of white? For the folks having difficulty with the eggs, try this: use one whole egg, then add one or two egg whites. Your choux should turn out more fluffy and crispy. And that's no yolk. Hi, John. Just found you and am so delighted. Will vote for you for sure! When you chop thyme, do you patiently remove the leaves from the sprig stems, or just chop the whole damn thing and let some stems get in? I've never seen or heard a culinary expert really show how they prepare the thyme. I get impatient pulling the leaves from each little stem. Do you? u need to pick the leaves, but not one at a time. pinch the stem and pull against the grain and they will all com off, almost. Done and done. Made this tonight with a family recipe beef stew and these were AMAZING!!! Thank you so much for all you do and keep it up! With 1/2 cup flour, the dough is too soft and watery. I tried 2 cups and it's still soft. Did you mean 2 cups of flour? No it's a half cup flour - watch to vid again you are doing something wrong. You can see the texture of the dough in the video. I just made these.... and they puffed up BEAUTIFULLY. I am so happy! okay...just puffed these...aaaaaawsome! the key is the whip the heck out of it after each egg addition, it think! thanks! hi i have question is it possible i can replace the white flour with alum flour / meal. i was wondering chef John ? what kind of butter should i use unsalted or salted ? Re : "no that's normal, browned outside creamy inside"
Are they supposed to be creamy inside or hollow ? I just made them and they were not hollow, but had a soft light (almost 'creamy') center. They were cooked though. They were ok, but I thought they would end up hollow and less doughy. And bigger. I only use unsalted butter. thanks! Awesome, I love this stuff! Once I decided to do it, I did a little looking at the pate a choux stuff in some of my cook books. This is one HIGHLY useful recipe and technique. The same dough with diff additions makes cream puffs, eclairs, gougeres, profiteral, bengets, and churros. Plus, I see they can gnochi, and dumplings if put into boiling water. I'm assumiong they wouldn't puff as much. Anyway, these went over huge this past weekend using the recipe as posted. My dad broke one open and shoved a sausage stuffed cherry pepper in it to make a gougere sandwich. Thank's for the recipe, Chef John. Hi Chef John, this looks delicious. I was wondernig since they are hollow would it be possible to halve them and then stuff something in them after they have been cooked like spinage artichoke dip or a suggestion from you? or are they to delicate of a pastrey to stuff? you can, but have to serve fast, as they are delicate. I've seen chicken salad served in them. enjoy! I made two batches. The first ones came out like cookies and the second batch puffed up but not like the video and were not hollow inside. I agree with the previous egg comment. I think the egg whites make it soupy. I used two eggs but strained some of the egg whites. Tricky recipe I have to say. I also think there should not be a 1/2 cup of cheese. That is to much and does not let the dough rise. I am going to use less next time and see how that works. Maybe third times a charm like they say. I used rosemary in the second batch and they were very tasty. not sure what to say, other than this has always come out for me as shown. the recipe is a very classic formula, so errors are usually with the technique not ingredients. Great recipe! I just made some for the first time and they were delicious. I was worried about getting deflated puffs, but they were perfect. As for the comment about the egg whites making it soupy, I did notice that at first... but just keep stirring it until the dough comes together (just like in the video). Thanks for the recipe, chef! Yum! Can I use mozarella instead of cheddar? You could but mozz has very little flavor. Lovely, lovely. I love the way your dough looks in the video. Now I know what to aim for when I bake tonight. Thank you chef. p.s. I had a Tartine gougere over the weekend and have been haunted ever since. Was so delighted to find your blog. Happy, happy! Hey, I've seen Ina garten Make the the cheese Puffs on food Network but she use a food proceesor while putting in the eggs. So I made the puffs and they were so good. Thanks for showing the puffs with cheese, I'm going to make those for our next family get together. why isn't there instructions on how to make the choux pastry ? it would have been easier and i could just print it out to use . Sorry, I'm too busy making free videos to type. Maybe you would volunteer to type it up and I'll post it. though I made sure I use the same amounts.. I blended the eggs pretty well.. but still nothing improved .. I'm really sad .. help me plz ..
Oh my! Those are almost chipá! I think I heard you say that in the video. First of all, I really LOVE your recipes and videos. I'm making half of them before the month ends! I spent half night here, just watching your videos and drooling all over them. You're good explaining and making those look easy and delicious, so everyone wants to make them right away. May I say how I make them? This could help people here and also the ones who said they didn't like them hollow. Here in Argentina those are very popular, and a typical recipe. The recipe for chipás is almost the same you used there, with two major differences. First, we use mandioca flour (I don't know what the name would be in english, sorry), wich makes the puffs more... well, puffy, without the need of having so much trouble with the mixing and quantities. Second, the cheese. I use the same amount of cheese than flour - they have to be cheesy! If you can, get 3 types of cheese and mix them. You can also use cream cheese (is it called like that? the cheese that is soft and not like the parmesano and the others?) and a little bit of other hard cheese. With two eggs you are good, add some milk (just some, to make the preparation soft and easy to handle, not so sticky), more salt and voilà! Just in case anyone misunderstood me, I wrote the things that I do differently from you. Well, I hope that helped, and that you don't think I'm rude, saying all this stuff in your site. I just made those and they turned out technically great, exactly like yours, but tastewise it´s kind of bland, not cheesy enough. I used gruyere and gouda, even more than in the recipe. Since I cant get sharp cheddar here, do u think parmesan would be a good replacement? It has a different texture, so I am not sure. I also like the feta idea edward suggested, what do u reckon, chef John? btw. blue cheese fritters were mazing! Thanks! He talks about cheeses that can be used and there is a troubleshooting section as well as his recipe. And this guy is really funny, almost a CJ level, but of course nobody compares to our beloved Chef John. The blogpost was especially usefull for me, cos I cant get sharp cheddar where I live. As much as I love cheddar, in continental Europe it is considered somewhat inferior to all those great french cheeses, so even a specialized cheese shops dont carry it, only the mild variety that doesnt work in the recipe. would it break anyone's heart if I added a little chopped cooked bacon to the choux?....really I'm asking would it break the choux puff?